Christ is not only the Savior of the world (John 4:42; 1John 4:14), but He is also its righteous Judge. The Lord Jesus will come in vengeance toward those who have not obeyed the Gospel and demand from them an account for every sin and transgression of His Law (2Thess. 1). The Bible tells us that the Lord Jesus will judge both the living and the dead (2Tim. 4:1). Both believer and unbeliever will stand before Him, everyone must give an account (Act 10:42; Matt. 25:31-46; John 5:22-23; Rom. 2:5, 16;14:9-10; 1Cor. 4:5; 2Cor. 5:10; 2Tim. 4:1). See Chapter 32. John 5:22-23 The Father judges no one, but has given all judgment to the Son, 23 that all may honor the Son, just as they honor the Father. Whoever does not honor the Son does not honor the Father who sent him. Matt. 25:34 Then the King will say to those on his right, ‘Come, you who are blessed by my Father, inherit the kingdom prepared for you from the foundation of the world. Matt. 25:41 “Then he will say to those on his left, ‘Depart from me, you cursed, into the eternal fire prepared for the devil and his angels. It is a terrifying thing to fall into the hands of the living God (Heb. 10:31) and to stand before Him who can see you as you are (Rom. 2:16) and require an account of everything (Matt. 12:36). 2Thess. 1:9-10 They will suffer the punishment of eternal destruction, away from the presence of the Lord and from the glory of his might, 10 when he comes on that day to be glorified in his saints, and to be marveled at among all who have believed, because our testimony to you was believed. Isa. 53:10 Yet it was the will of the LORD to crush him; he has put him to grief; when his soul makes an offering for guilt, he shall see his offspring; he shall prolong his days; the will of the LORD shall prosper in his hand. ...;For as by a man came death, by a man has come also the resurrection of the dead. The Holy God cannot stand in the presence of sinners, they will be consumed if He did. Yet for the glory of His grace, He had, in Christ, foreordained the salvation of a particular people. He had even in some way foreordained the Fall (see Chapter 3 on God's sovereignty over evil). The means of restoring that relationship was for the Son of God to come down and bear the curse of the law on behalf of sinners. Gal. 3:10-14 For all who rely on works of the law are under a curse; for it is written, “Cursed be everyone who does not abide by all things written in the Book of the Law, and do them.” 11 Now it is evident that no one is justified before God by the law, for “The righteous shall live by faith.” 12 But the law is not of faith, rather “The one who does them shall live by them.” 13 Christ redeemed us from the curse of the law by becoming a curse for us—for it is written, “Cursed is everyone who is hanged on a tree”— 14 so that in Christ Jesus the blessing of Abraham might come to the Gentiles, so that we might receive the promised Spirit through faith. Paul teaches us in this passage that the way we came free from the curse of the law is because the Lord Christ Himself became a curse for us. God cursed Him as if he was Someone who did not "abide by all things written in the Book of the Law" while we know that the contrary is the case! But for our sake, He became a curse. The Adamic Covenant of Works has no more the capacity to offer eternal life to those who obey it since only its condemning power is exercised now. The covenant is broken and what it now administers is the curse of the covenant. The Bible credits the existence of death and sin back to the disobedience of Adam (Rom. 5:12; 1Cor. 15:21). That was the punishment for disobedience of the Adamic Covenant (Gen. 2:17). Therefore, since only the condemning power of the covenant was in work and not the life-giving power, the Lord had to make another covenant if He wanted people to have fellowship with Him. This is where we come into the discussion of the Covenant of Grace, which will be taken in paragraph 3 and the Covenant of Redemption, which is the basis for the Covenant of Grace, to which we now turn. 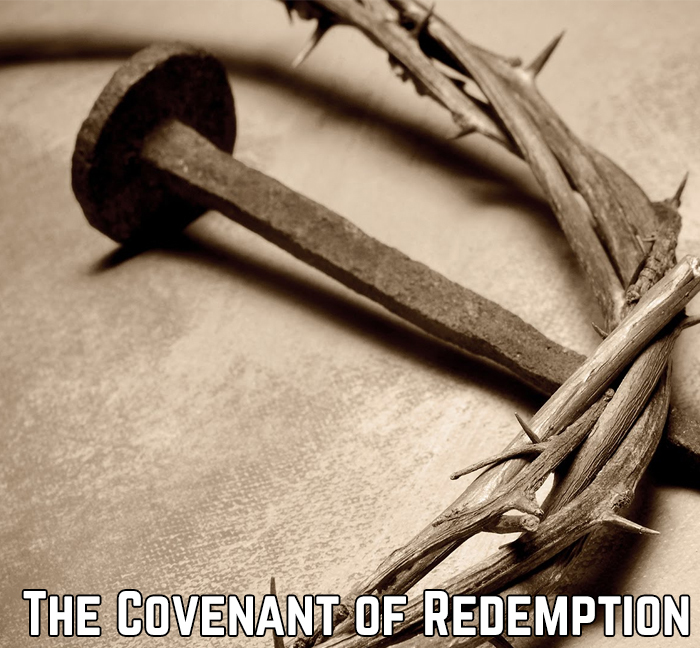 This Covenant of Redemption refers to the covenant within the Trinity which established the plan of salvation, i.e. the agreement within the Godhead that the Father would appoint the Son to give up his life for mankind and that Jesus would do so (cf. Titus 1:1-3). Well, did He or did He not accomplish that which the Father and He Himself intended? Did He, or will He save the lost and those whom He came to seek or not? Will He save His people or will He not? Had He a people in mind when He offered Himself on the cross or not? Our Lord is not a potential Savior, but an infallible and actual Savior, by virtue of His worth and Father's will for Him. It was the purpose of the Trinity in the atonement to save, redeem, free people from their sins. In Hebrews 2:14-15, we read that Christ through His incarnation and self-giving “destroy[ed] the one who has the power of death” and thereby “deliver all those who through fear of death were subject to lifelong slavery.” Does Christ try to deliver all people without exception, or does He actually deliver His people from the power of Satan and sin (cf. Rom. 6-7)? The passage begins with “Since therefore the children share in flesh and blood”. We have to ask ourselves, which “children” are that, and we will find our answer in the previous verse. ‘And again, “I will put my trust in him.” And again, “Behold, I and the children God has given me.”‘ These are citations from Psalm 18:2 and Isaiah 8:17. The children are in other words, the elect, all those whom the Father gave to the Son. It is for their sake that He partook of flesh so as to deliver them. Will He or will He not deliver all those for whom He died and whom He intended to deliver? ...o debate among Calvinists about whether the elect can lose their salvation. Someone who accepts Unconditional Election must believe in perseverance. It is logically necessary, for to contend otherwise is to say that God has unconditionally chosen a person to be saved, but has not chosen to preserve that particular person, which is absurd on its face. Therefore, the one who accepts Unconditional Election inevitably must accept the Perseverance of the Saints. For to reject the doctrine is to contend that God fails to save those whom He intends to save. See Chapter 3, paragraph 5 for more on Unconditional Election. ...tial to understand that the moral law is a reflection of God’s holy character. He is the standard. There is nothing above God. We will stand before Him and give an account on the Day of Judgment and the standard to be judged by is His perfection, as expressed in the Decalogue/moral law. If you are afraid, you should be, because none of us can live such a perfect life, therefore, flee to Christ the Savior! ...o-believe-to-the-saving-of-their-souls,-is-the-work-of-the-Spirit"chapter 14:1). Therefore, even the condition for our justification and life with God was provided by God. 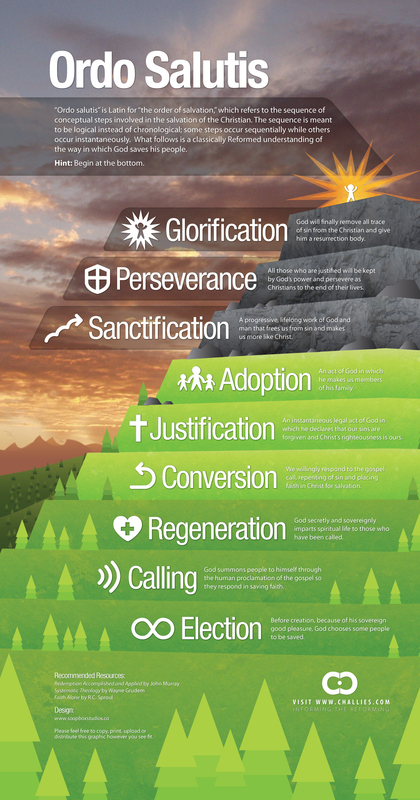 This is the glory and greatness of the New Covenant of Grace in which we stand and have our relationship with God. All the requirements of the covenant are provided by God through His Spirit based on Christ's work and obedience. ... mean that men never disobey and resist God, but that is not how the phrase has been historically defined. Rather, it means that the resistance which natural man always has to the Spirit (Acts 7:51) is overcome when God decides to save a person.